Like buses it's been a while since we've had a decent heavyweight boxing match to watch and now several turn up at once. The other obvious big fight, arguably the biggest in years being Joshua vs Klitschko of course, but that's a little while off yet, so it's time to focus on David Haye vs Tony Bellew. Predictably the build up to this fight, has been pretty firey. The theatrics may well sell tickets but they're little more than a side show really, as most fighting fans just want to see the action on the night. The odds as of now, to win the fight are David Haye 1/5, and Tony Bellow 4-1. To me that sounds about right. 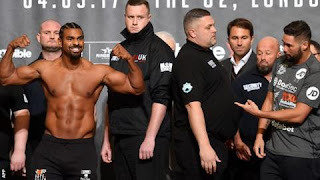 It's a nice payday for both, and at a level that Haye is comfortable with, as he gradually ups the quality of the opposition in order to place himself in the gravitational field of the likes of Joshua or Klitschko, who would very likely be a level too much for him. Much in the same way, this match up may well be a level too far for Bellow, but I can't and don't blame him for taking the fight, and he'll definitely give it his all. If I was looking to place a bet on this, it must be said that there isn't a great deal of value in the odds-on Haye win bet. Therefore, I'd most likely go for round betting of Under 4.5 rounds at 11/10. This covers both the likely outcome of an early(ish) Haye win, but also covers the outside chance of Bellow causing an early shock. It's more likely than not to go this way in my view. I'll be watching anyway, though down the pub, as I can't bring myself to shufffle £16.99 in Murdoch's direction. Cheers!